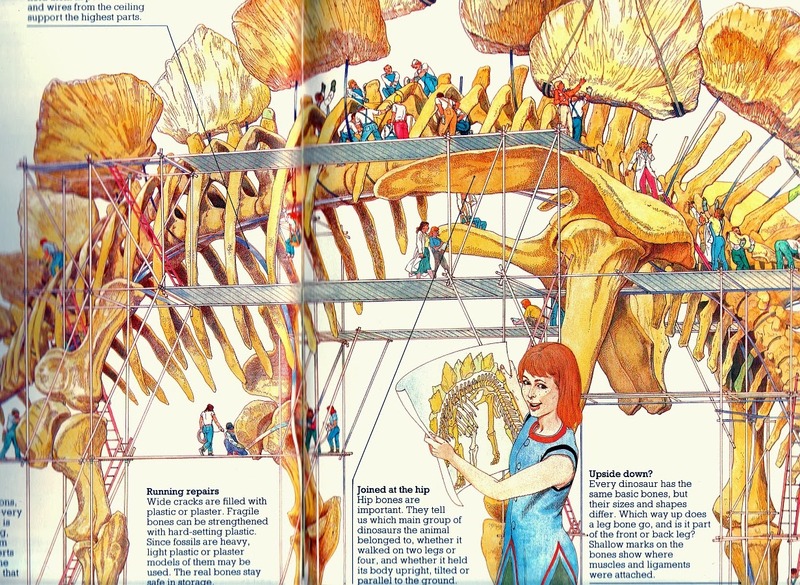 The admirable effort of a single writer/illustrator, The Amazing World of Dinosaurs comes to us from the amazing world of 1981. It was a primitive age, when Donkey Kong was the cutting edge in video game entertainment, Bruce Dickinson had only just joined Iron Maiden, and popular palaeoart stood at an intriguing juncture. On the one hand, artists' work still owed much to the classic depictions of 'great fossil lizards', but there was nevertheless a conscious move towards more recognisably 'modern' restorations, spearheaded by the likes of John McLoughlin (who coined the phrase 'great fossil lizard' when referring to the outdated ideas he railed against). But I've said as much before. 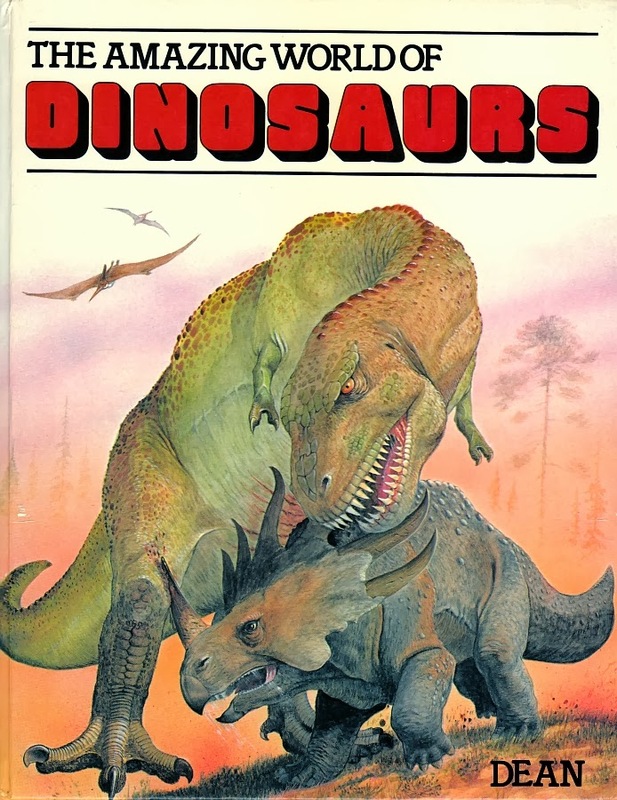 The Amazing World of Dinosaurs is interesting because it combines the old, the new, and the occasional foray into the bafflingly, spectacularly, book-crashingly wrong. TetZoo Time logo by John Turmelle, via his DeviantArt gallery. Thanks to Albertonykus and John Turmelle, there is now an Adventure Time/ Tetrapod Zoology Podcast mashup called TetZoo Time. It's just getting started, so this is the perfect time to hop aboard. 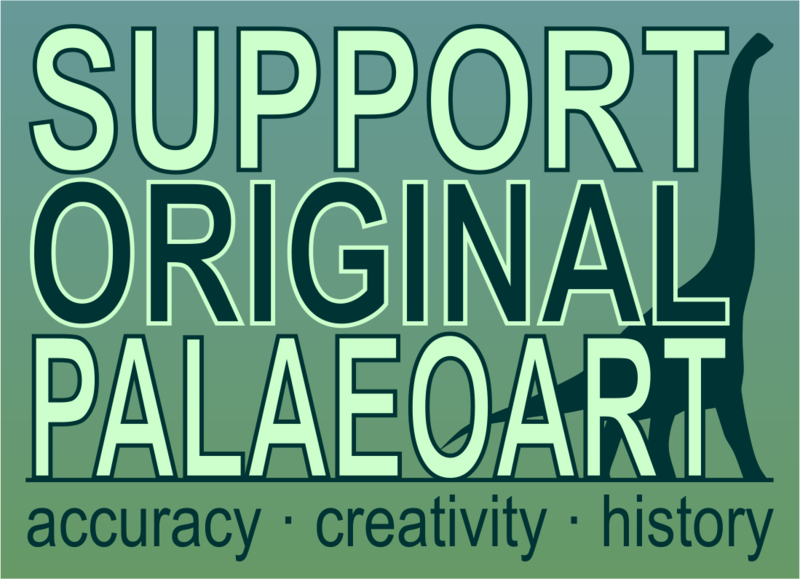 Darren Naish (of the absolutely essential Tetrapod Zoology blog) and John Conway (of the equally essential John Conway's artwork) have been turning out the TetZoo Podcast since February, having released episode 17 today. It's a fun listen, because how could Darren and John casually chatting about tetrapods living and extinct, movies, their publications for Irregular Books, and their various misadventures not be? As for the TetZoo Time creative team, John Turmelle is also known as ClassicalGuy on DeviantArt and Albertonykus of the Raptormaniacs blog and comic have really nailed the Adventure Time style, including the painterly title cards at the beginning of Adventure Time episodes. The comic is full of little in-jokes for followers of Darren and John's individual work and the online paleontology community. This includes an absolutely perfect Ice King stand-in who will delight fanciers of heretical amateur paleontology. Time for some more Fornari and Sergio (see also: part 1), and I think it would be pertinent to begin with what seems to be one of the most fondly-remembered illustrations from this book (based on Facebook comments) - an oversized Stegosaurus skeleton, swarming with diminutive museum workers. Labels: Giuliano Fornari, Sergio, the memes! While Walking With Dinosaurs might have been an enormous disappointment, the consensus is that it's also an exceptionally pretty and well designed one. Unlike our intrepid reporters Mark and Niroot, I haven't seen it, partially because I didn't want to subject myself to it, and partially because I couldn't bring myself to subject someone else to it either. That's why the video below, from Wired, is so cool: it gives us a look at the dinosaur designs with a minimum of inane, insulting chatter. 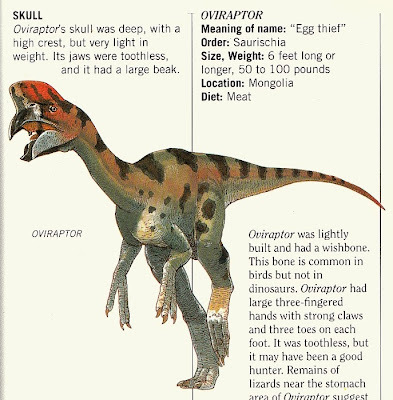 There are some minor surprises as well; I had no idea that Parksosaurus and Hesperonychus were in the film. Obscure taxa in major studio releases are one of those things I feel like I ought to support. Unless it means, say, sitting through Walking With Dinosaurs. Like so many books of its time, Dinosaurs and How They Lived is an intriguing hodge-podge of the old, the new, and the flagrantly copied. 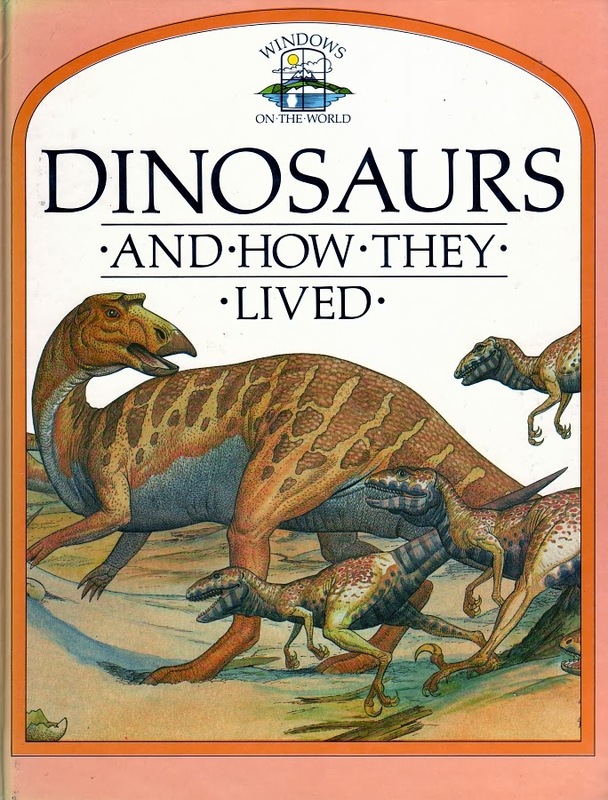 By 1988, the texts of books like these reflected (by and large) post-Dino Renaissance ideas of highly active and evolutionarily successful animals. Outside of top-flight palaeoartist circles, however, the art often leaned on the accomplished, but badly outdated work of '50s-'70s illustrators. And John Sibbick. Pencil and gouache on recycled paper, 95mm diameter. 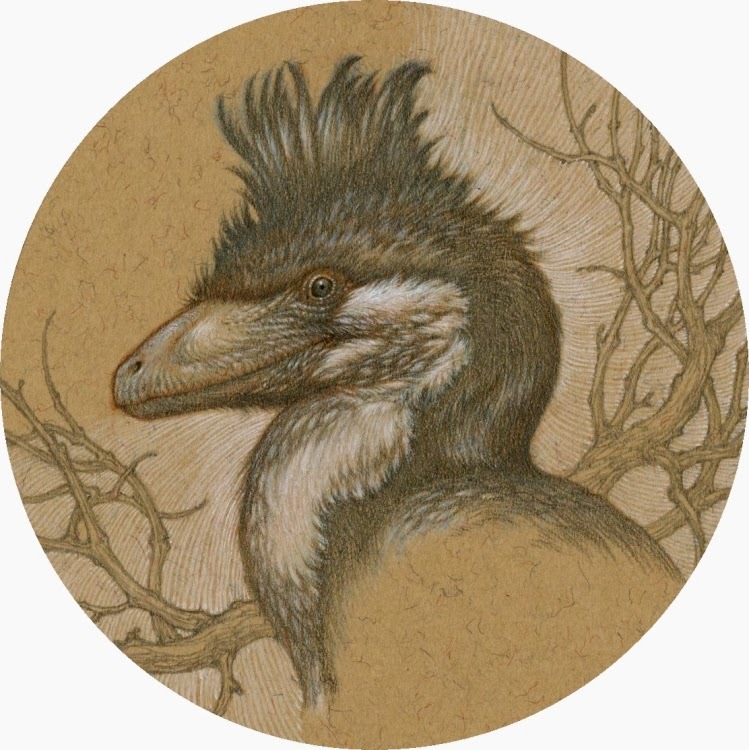 Prompted by Marc’s comment on my New Year post, Deinonychus with a ‘top hat’ feathery crest. I began fully intending to do a quick silly sketch, but it took a peculiarly serious turn. Although I've mostly focussed on the Steve Kirk spectaculars in Dinosaur Worlds so far, the supplementary illustrations (or "small featured creatures") definitely merit closer inspection. Many of them are the work of James Robins, a skilled and rather under-appreciated artist whose meticulous, often surprisingly prescient approach deserves praise aplenty. 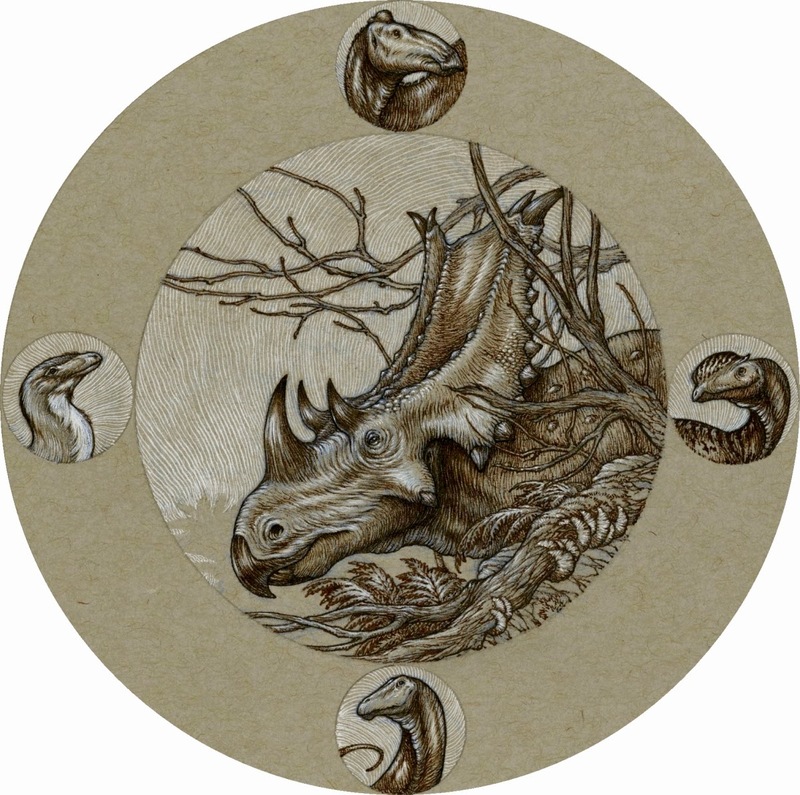 Sepia ink and gouache on grey toned Strathmore paper, 144mm diameter. Image can be opened in a new tab for full view. Not as prompt as I would have wished (prompt, me? The very idea...), but Epiphany is still a good time to wish all of our readers a very happy 2014 from the Chasmosaurs team. Regular readers will already be familiar with the four saurian portraits of the blog authors, but should you need a reminder, you may like to revisit last year's New Year greeting. It's not a centerpiece of the city's public art, but one park in Bloomington, Indiana does boast a "dinosaur" sculpture of its very own. Traveling out of your way to see it may not be advisable, but's certainly worth a look if you're in the area. It may be your only chance to see a Dimetrodon with a thagomizer. Originally, the sculpture was meant to be carved in the shape of a Stegosaurus, but since Stegosaurus don't have sail-backs, the artist chose Dimetrodon so people would have a place to lean their backs. Not wanting to give up the large loop on the bench, a Stegosaurus tail was added, making this bench a hybrid dinosaur of sorts. I'd guess that the design changed before carving ever began, with the spiky tail the only part of the original sketches to be retained. Call it artistic license. The plaque does explain that Dimetrodon was not a dinosaur, which is great, but it's a bit muddled on evolutionary history, noting that "dinosaurs eventually evolved into modern day reptiles and birds" and that Dimetrodon is "actually an early ancestor of modern day mammals." A few points for effort, I suppose. Update 1/6/13: Meant to include that this is, as indiated in comment by Mark Robinson, in Bloomington's Bryan Park. It's a real nice park.